Have You Ever Been Surprise By Garlic Turning Blue-Green? I was about to throw all my blue garlic out. It was such a shock to see my garlic turn blue. I like to buy garlic cloves and blend them up in my blender with a little water. They are so much stronger in scent and flavor rather than buying the already hulled garlic cloves that come stored in a jar. I debated whether or not to purchase them or overcome the dread I feel when having to hull garlic cloves, they come in so many sizes and shapes inside the bulb and like a box of chocolate, you never know what you are gonna get. Then, knowing that I had no idea how long those cloves had been in that jar I decided to get over my dread and go ahead and hull the garlic while watching a crazy news video on YouTube. I won’t mention my favorites but I will mention that many of the ones that are considered “alternative” media are only a stone’s throw away from the MSM when it comes to all kinds of crazy. I have done this routine several times in the past. But this time, I decided to add a little vinegar to it to keep it fresher longer. Somewhere in my head I got the idea that vinegar would do the trick, and of course, “Real Apple Cider Vinegar” by Braggs would be the ultimate ingredient for my desired affect. So I drop a little bit in, blended it down into small pieces and put it in a jar in the refrigerator. However the jar I had was a bit too small so I had to leave some out to be cooked with dinner later. To my surprise, when I returned the small portion I had left out had turned the prettiest green ever! My sensibilities took hold and the battle within started. Of course food poisoning was my first thought and I quickly threw it away assuming that the garlic I had stored away in the refrigerator was safe and sound. The next day, I noticed that it too had begun to change. And with each passing day it got greener and greener and bluer and bluer. I consider myself an alchemist especially when it comes to preparing a meal. So as a scientist I began to think some type of chemical reaction had taken place. However, I was not sure if the reaction was safe or not safe. I went threw the antics of taking it out of the refrigerator and putting it back, taking the lid off and smelling it and putting the lid back on. It did have a slight metallic scent to it, but it smelled more like a really strong dose of garlic. 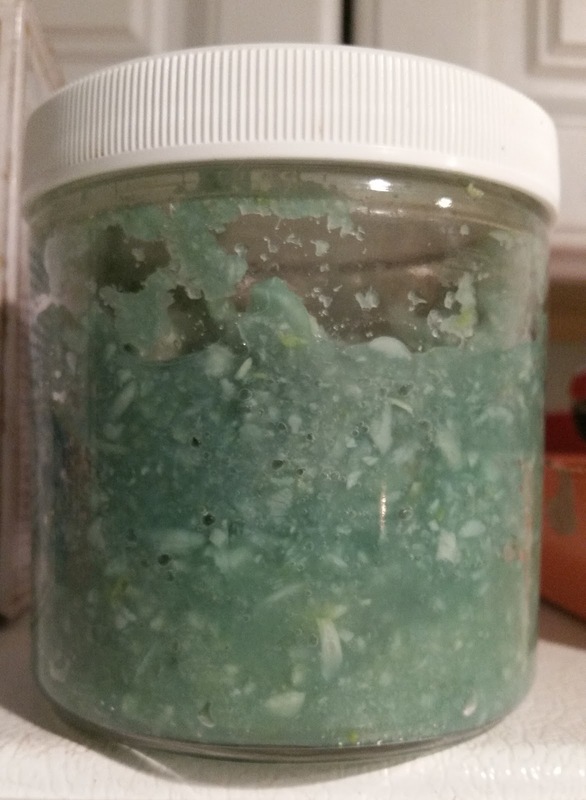 I remained uncertain for several days after, while my freshly chopped in the blender and stored in the refrigerator garlic turned even bluer green. I began to question everything that I knew. For years I have used garlic and I never, ever saw this happen. How could this not be a ominous sign of potential food poisoning? Ironically, we have come to see green, the most healing color ever, as poison! Especially when it sits on top of meats, breads, yogurt, cheese and now it’s sitting inside and outside of my GARLIC!!! Thankfully, before I wasted $2.00 and at least an hour of time I decided to check it out on Google. My question started off like this, “Fresh Garlic turns…..” and before I could write the word green Google had already figured me out. That’s Google for you, reading your mind, I say. I felt that it was completely ludicrous to even ask such a question. Whoever heard of such? GARLIC TURNING GREEN!!! But after years of using garlic, I really began to wonder if I may have come across a bad batch or maybe even a poisonous one. I began to question my home remedy Braggs “Apple Cider Vinegar”. I began to wonder if I had poisoned my food and if I would be too sick to attend my online meetings or live performance. I really began to worry, so my only other option was to look it up and to my surprise this is not an unusual occurrence but it has been done purposefully by the Chinese in some of their recipes. SMDH, who knew? Well, now I know and now I can put that garlic back in the refrigerator and enjoy its even stronger taste and color. What A Difference A Google Search Makes!! Why Does Garlic Turn Blue and Is Blue Garlic Safe To Eat? Perhaps you, as I, have been cooking with garlic for years, expecting garlic to remain a kind of off-white, uninteresting color throughout the cooking process. Then one day, the garlic turns a bright blue-green, even an aquamarine or turquoise color, transforming a familiar dish into an odd concoction of color accents that undermine the familiar tones we expect. The visual impact of this changed dish can be likened to the colors of trees in autumn, with their red, gold, green, and dun colors, suddenly being splashed with fluorescent hues of blue and green reminiscent of the op art of the 60s. Autumn colors aren’t supposed to display this jarring contrast, nor is food. It’s unsettling. 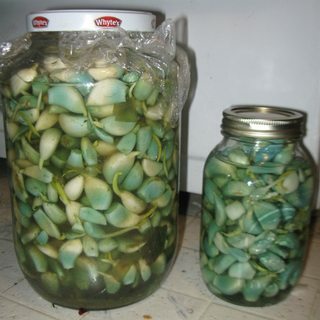 If one day your garlic turns a shocking shade of blue, making your homemade pickles, pork roast, or pot of cabbage and kielbasa look strange and even poisonous, be assured that no matter how strange it looks, it hurts only your eyes, not your body. This past Thanksgiving I volunteered to bring our family’s traditional Polish kielbasa and cabbage dish to the holiday dinner. Ours is a simple recipe consisting of traditional Eastern European ingredients including onion, garlic, cabbage, sausage, black pepper, and apple. Our version of this dish is mild-tasting and slightly sweet, and we all love the recipe just as it is. But this year I decided to charge up the flavor a bit by adding sauerkraut to the cabbage, something I had never done before. By early evening on Wednesday, my kitchen smelled heavenly from the onions, cabbage, apple, and kraut slowly simmering on the stovetop, from the freshly pressed whole head of garlic waiting to go into the pot, and from the thinly sliced kielbasa resting on the cutting board. It was a peaceful moment, leaving me with the feeling that all is well with the world. An hour before the pot was to finish, I added the pressed garlic and sliced kielbasa and folded them in. Immediately, I began to see a few bright blue-green bits of color in the pot. As I stirred the pot, more began to appear. Soon, the pot contents were lavishly sprinkled with shocking, almost neon-like, blue-green, confetti-looking bits. I started picking them out and putting them in a small dish, but soon gave up. It seemed the more I removed, the more appeared. Absent any sign of spoilage such as foul smell or mold, yourblue garlic is safe to eat. There are so many variables causing accidental garlic color change that it may be impossible for you to duplicate this surprising event in your home kitchen. No one as yet has discovered how to turn blue garlic back to white, although continuing to heat the turquoise garlic may dull it down to a pinkish-brown.